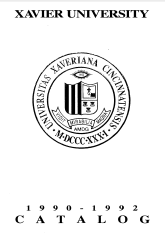 The Xavier University 2006-2008 Catalog is organized into several sections. The bottom of each right-hand page lists the content of the page. Refer to the Table of Contents or Index for specific references.